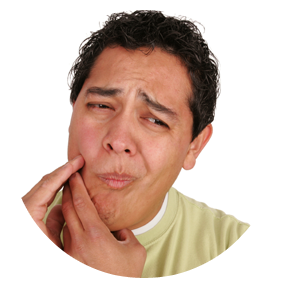 Have you been diagnosed with TemporoMandibular joint Disorder (TMD)? Providing relief of your symptoms is Dr. Mathew’s first concern, and he accomplishes this goal using ULF-TENS (Ultra Low Frequency Transcutaneous Electrical Neural Stimulation). It’s a very big term for a simple and effective way to relax your muscles with gentle massage that increases blood flow and removes waste products from your muscles. ULF-TENS achieves pain relief by stimulating the body’s production of endorphins, well known as a natural anesthetic. To begin stabilizing your bite, Dr. Mathew may recommend an orthotic, a device worn over the teeth much like a mouth guard. The orthotic is easily adjustable throughout treatment until your bite is permanently stabilized. At this point, Dr. Mathew can move on to permanently adjusting your bite to the correct position. Long-term management is also a priority and Dr. Mathew will discuss strategies with you to manage your TMD over time. Keeping the goal of long-term health of the TMJ. These options may include continued use of the orthotic, teeth straightening, or dental prosthetics. Isn’t it comforting to know Dr. Mathew and the dedicated team at Artisan Dentistry in Salem, New Hampshire and Newburyport, Massachusetts are waiting to help you? We hope you’ll take a moment today to contact us and schedule your complimentary consultation. The first phone call is all it takes to get back on the road to good health, and you’ll be so glad you did.